This Indoor LED Sign Is a Unique Alternative to Other Illuminating Signage Systems! 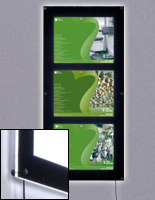 Only 3/8" Thick, This Poster Holder has a Very Modern Style! The Cutting-Edge Look of This Indoor LED Sign is Ideal for Retailers and Restaurants! Energy efficient LED lighting is environmentally friendly and reduces energy expenses. Standoff hardware has a black finish to complement the black border on the acrylic overlay. 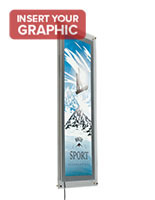 Panels mount in vertical or horizontal orientation for a variety of 11" x 17" advertisements. Lighting diffuses to the beveled edges of the acrylic backer to create a glowing effect. This backlit indoor LED sign features an innovative design, which essentially consists of two acrylic panels connected with standoff hardware. The back panel has embedded lighting. A diffusion pattern disperses the light evenly through the indoor LED sign that is cutting-edge. Posters are positioned on the back panel. Then, the acrylic overlay is placed over the posters, and fixed to the back panel of this indoor LED sign that mounts with black standoffs. There are slits in the backer that allow users to slide graphics in and out of the frame without dismounting the unit from the wall. 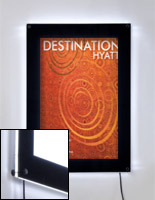 This indoor LED sign for 11" x 17" posters has beveled edges that light up when the unit is turned on. However, the opaque black border of the acrylic overlay deflects the lighting against the wall, resulting in a captivating gentle glow around the display. 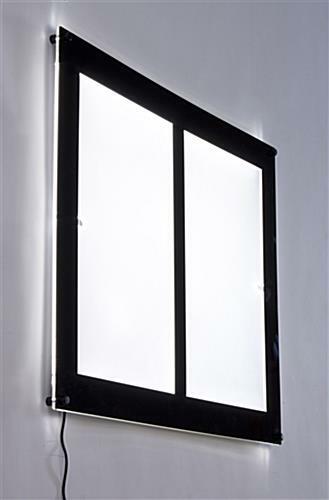 The light box, indoor LED sign that has a new-age style, comes with screws and anchors for use with the standoffs. 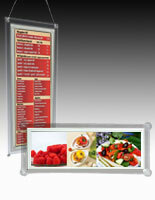 Advertisers can mount the light box vertically or horizontally. 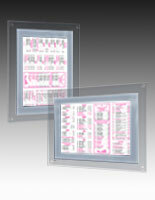 The front overlay creates a black border around 11" x 17" prints, which further enhances the illumination. The versatile, contemporary design of this indoor LED sign is appropriate for use in wide range of settings and businesses. 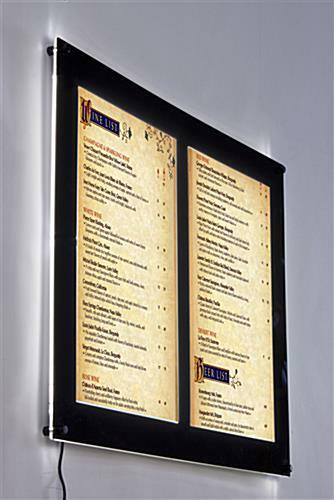 Restaurants use this energy-efficient indoor LED sign to exhibit menus in entranceways. While many retailers position this illuminated signage near a checkout counter or new store fixture to generate increased sales. Even office complexes or schools can use these light-up signs to exhibit directories, schedules or operating ours. Many businesses will buy multiple units and mount side-by-side and/or in a vertically stacked configuration to create signage matrixes as well. Overall: 26-1/2"w x 20-1/2"h x 1-1/4"
26.5" x 20.5" x 1.3"